Objectness algorithms based on   Cheng, Ming-Ming, et al. "BING: Binarized normed gradients for objectness estimation at 300fps." IEEE CVPR. 2014. Performs all the operations and calls all internal functions necessary for the accomplishment of the Binarized normed gradients algorithm. 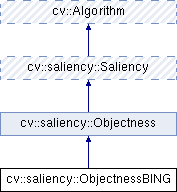 objectnessBoundingBox objectness Bounding Box vector. According to the result given by this specialized algorithm, the objectnessBoundingBox is a vector<Vec4i>. Each bounding box is represented by a Vec4i for (minX, minY, maxX, maxY). Return the list of the rectangles' objectness value,. in the same order as the vector<Vec4i> objectnessBoundingBox returned by the algorithm (in computeSaliencyImpl function). The bigger value these scores are, it is more likely to be an object window. This is a utility function that allows to set an arbitrary path in which the algorithm will save the optional results. (ie writing on file the total number and the list of rectangles returned by objectess, one for each row). This is a utility function that allows to set the correct path from which the algorithm will load the trained model.